The 2018 INSIGHT Research Symposium in August. Harborview Injury Prevention and Research Center’s INSIGHT Summer Research Program has been awarded a $500,000 grant by the National Institutes of Health to support research training and career development. The INSIGHT Research Program is an innovative, paid summer internship where undergraduate, graduate and medical students complete hands-on, mentored research projects on injury prevention and control. Throughout the program, participants conduct research and data analysis; meet with physicians, researchers and public health advocates; and explore opportunities and resources at Harborview Medical Center through field trips and workshops. The summer culminates in a competitive research symposium and poster presentation of the interns’ work. The grant, awarded through the R25 Research Education Program, will fund student stipends, professional staff support and other program costs for five years. The NIH Research Education Program funds activities designed to enhance training for the biomedical, behavioral and clinical research workforce, enhance the diversity of this workforce and recruit individuals to research careers in these fields. Education is a core part of HIPRC’s mission, and the center follows a pipe-line model of mentoring and supporting researchers through multiple stages of their educations and careers, ranging from high school students with an interest in healthcare to specialized postdoctoral fellows and working professionals. Since it began in 2014, the INSIGHT program has trained more than 100 interns from colleges and universities across the country. 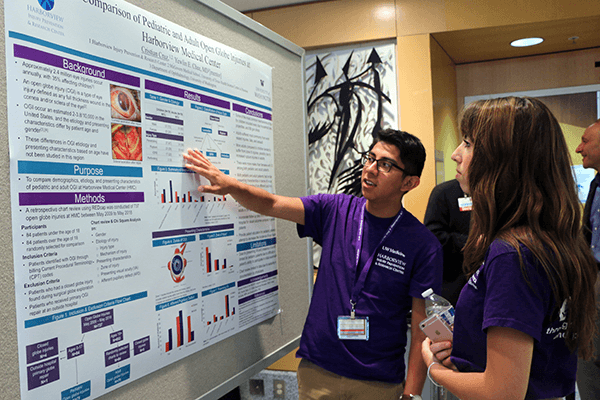 In 2016, a separate INSIGHT High School Summer Program was created with a focus on introductory public health, medicine, research and communication. HIPRC Director Monica Vavilala, M.D., also directs the INSIGHT program. By giving students a strong foundation in research and professionals skills, INSIGHT seeks to develop the next generation of injury control researchers and professionals. Applications for the 2019 INSIGHT Summer Research Program will open in November. For more information, contact INSIGHT Program Supervisor Smita Stepanova Pednekar at InjuryED@uw.edu.